NI’s custom, high-performance frequency-multiplier modules use state-of-the-art MMICs, discrete devices, and filters to achieve the desired multiplication ratio, power output, and spurious performance. Custom narrowband and wideband multipliers up to 67 GHz are available upon request. Please note that we only accept orders with minimum quantities of 100 pieces. Orders for TO-8 packaged devices will not be accepted beyond Sept. 30th, 2016. NI's custom line of narrowband, broadband, and fixed-tuned VCOs employ high-performance silicon bi-polar junction transistors (Si BJTs) to achieve very low phase noise. The use of hyper-abrupt silicon varactor diodes enables tuning capability, and GaAs MMIC buffer amplifiers provide the necessary power output and load isolation of the oscillators. VCOs are available in frequencies up to 67 GHz in connectorized SMA output type packages or other custom-designed housing. Please note that we only accept orders with minimum quantities of 100 pieces. NI’s custom line of narrowband, broadband, and fixed-tuned VCOs employ high-performance silicon bi-polar junction transistors (Si BJTs) to achieve very low phase noise. The use of hyper-abrupt silicon varactor diodes enables tuning capability, and GaAs MMIC buffer amplifiers provide the necessary power output and load isolation of the oscillators. 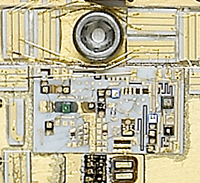 VCOs are available in frequencies up to 67 GHz and in connectorized SMA output type packages or custom-designed housing. Please note that we only accept orders with minimum quantities of 100 pieces. Similar to our VCOs, our custom PLOs use high-performance Si BJTs. In addition, utilization of highly-stable 100 MHz oven-controlled crystal oscillators (OCXOs), phase-lock loops (PLLs), and sampling mixers delivers very low phase noise and spurious performance. 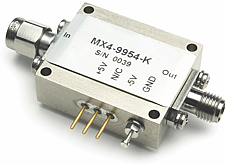 PLOs are available with external or internal references and in frequencies up to 67 GHz. Please note that we only accept orders with minimum quantities of 100 pieces. NI’s custom, fast-settling, low phase noise DTOs use high-performance Si BJTs and silicon varactor diodes to realize multiple wideband sources, which are combined using Wilkinson power combiners. GaAs MMIC buffer amplifiers provide the necessary power output and load isolation of the oscillator. Efficient use of EEPROMs yields high accuracy, high resolution, and high linearity. In addtion, a proprietary technique is used to achieve fast switching and low spurious. DTOs are available in frequencies up to 67 GHz. Please note that we only accept orders with minimum quantities of 100 pieces. NI’s custom, low-jitter, high-speed clocks provide differential and non-differential sine-wave output and employ high-performance Si BJTs along with hyper-abrupt silicon varactor diodes to achieve the required output frequency. GaAs MMIC buffer amplifiers provide the necessary power output and load isolation of the oscillator. High-speed clocks are available in frequencies up to 67 GHz and in connectorized SMA GPPO output type packages or custom-designed housing. Please note that we only accept orders with minimum quantities of 100 pieces.